WhatAboutAdam on a YT forum in the year of our lord 2019?!?! (wow that doesn't seem real yet) AND PLAYING HEARTTHROB WITH D&P!!! So strange to me that he's no longer on the public figure side of things and is instead behind the scenes. I was a big fan of Adam back in the day, and I miss seeing him around (even if I'm not actually seeing *him*), so thank you @Philena, as he doesn't use twitter anymore and I don't have snapchat. Also I'm so happy to find out they still hang out! And @alittledizzy I believe Adam's name was removed from the atf website early last year. (And sidenote, with Marianne and Tomska being removed in December, along with a gradual reduction of their talent list, I do wonder what's happening with the company, and what D&P are going to do about that.) But good to know they can hang out with people in London who don't work with or for them and who aren't named Bryony (even if they are evidently only capable of this if Bryony is present lol). Also I feel like Noel would find Phil so endearing (I mean ok who wouldn't) and I just think their weirdness would work so well together, and when Phil says the stuff that only Phil can, instead of hitting him with the heart eyes + This Guy combo like Dan, Noel would just roll with it and work off it and it would be lovely and hysterical. ANYWAY I'M MAD BECAUSE NOW I NEED PHIL AND NOEL TO HOST GBBO! oof i haven't been posting much for the past couple days, nothing to talk about really. but!!! aww!!! they played heartthrob with adam!!! and bryony!!! love that. i actually really want that game tbh. Makes me wonder if D&P might be putting together their own talent/production house in the same vein of Caspar and Joe’s involvement with Influencer. There’s obviously a lot they can bring to the table aside from capital investment... they have their own idepentantly owned and run Merch shop with distribution channels on 3 continents, deep BBC and industry connections, experience with large scale world tours and obviously massive brand recognition. Could be a nice organic extension of their business (future income streams, empire expansion, yada) and an interesting way to put their talents and experience to use in a more behind the scenes way without specifically relying on the D&P brand. i woke up to phil being a gbbo host and i'm so here for it. 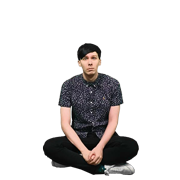 Gbbo, one of the most wholesome shows and PHIL LESTER aka.... what? Best human being on this planet? Can you imagine? It’s nice they still hang out with Adam, I remember looking up his YouTube channel, but found his final video which wasn’t a happy one, he seemed kinda bitter, I don’t know if his audience had declined or if it was something else, I forget what he said (gotta feel for some who know Deps and have seen their attention skyrocket). It is nice. I always feel a bit sad when I think of people Dan and Phil have lost touch with over the years. I remember watching some videos from the whataboutadam channel that were quite old, but he was also in a drag makeover video less than a year ago. ...Hey deppy, you know what the natural evolution of punk edits and pastel edits videos would be? Drag makeovers. There's so much interesting discussion going on but my mind is stuck on Phil hosting GBBO and I don't think I've ever wanted anything more. Phil did an instagram poll and planets are winning, proving that there is some justice left in the universe after all. Capita£ester is really not taking the hint that he can sell double the merch is he? Meanwhile Dan better be in a video inspiration cave and not a GW2 cave, cause I'm a bit annoyed at how many Dan and Phil Instastory Compilations I've been making lately. I hate it but I really want popcorn socks so much. As an avid popcorn enthusiast who eats it daily, I want to rep my popcorn love - most existing popcorn related designs are circus-y or movie-themed. idk. after his hoodie almost had "69" on it.... it feels right. feels organic. if nothing else, phil's brand is innuendo-laden "innocence". - Phil posted the Letter from his young-self video on the 25th. I still don't even have my dvd. In the US, so it's not an overseas shipment, ordered the first hour it was available. It's getting ridiculous. TIL that Getting Over It was less than a year ago and I'm shook. 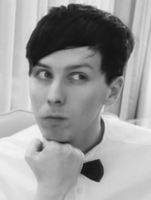 You know who actually just roll with Phil and his weirdness? PJ. I want a Phil and PJ collab so bad. Their future quiz video always had me melting because just how well they worked together. Ikr. It made me realized something I never knew I needed. There is another thing that is my biggest fantasy tho. Professor Phil. I know it's not gonna happen but I like the idea of it. I mean, we know Phil likes his university days. He described York University as beautiful and he talked about his university days a few times on liveshows. He also had nice housemates and he did pretty well with his study. He already has a master's degree, so imagine him coming back to uni to get a PhD. Professor Phil teaching uni students how to make digital content and giving them fun assignments? Yes. But all jokes aside, what are the chance Dan or/and Phil going to uni again? I'm one of the people who voted for lava lamp. Well, if that's true, then that might even suit Phil more lol. It's very, very difficult for me to imagine either of them going back to uni. I don't think Dan in 2019 would adapt any better to the hard structure of university courses and the workloads being on a deadline than he did as a teenager. I think he's only good at functioning in that environment with outside pressure in a very immediate sense (you have to be awake at this time because we have to be at the studio at this time and if you aren't then thousands of people are left waiting) and not in a self-motivating sense. Which is sort of understandable - it's not a skill he's ever had to learn, his career leaves room for adaptability with scheduling and still a sense of success. And as for Phil, I just don't think he'd want to, I guess. Not that he'd hate it but that it's not something there's a need for in his life. On my odyssey of screen-recording to preserve old annotations, I'm discovering how many clips there are for each interactive video (the first one, Space Adventure, is huge, over 70). Which Deadly Animal Are You has 14 results according to the last shot of each result clip, but there only seem to be 12 and two people in the comments of the main video have said the same thing. Results list under spoiler in case anyone knows or wants to click through it all to find if there are 2 I've missed, otherwise I'm leaving it as done cos it seems to be! My love for Phil's creative mind and younger self has been reaffirmed today. The space adventure especially must have been a heck of work. Can we appreciate that Dan followed every single thread in space adventure and said on twitter he was in love with Phil because of the soundtrack? Can we? The new Dan and Phil sexuality/attraction FAQs post is now live! This was a pretty hefty undertaking by the mod team and @obsessivelymoody so first of all: huge thanks to everyone that worked on it with me! But even with multiple people brainstorming moments there is undoubtedly a whole lot we missed, so if you know of something that should be there instructions on how to contribute can be found at the bottom of the post. Really looking forward to reading the thread! Thank you to everyone involved! 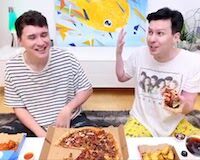 On the list of things that we would want from D&P, may I ask for a Sushi Mukbang? I've hit a snag with the Lion of Inflatable Destiny as somewhere along the way Phil has removed the "there are 7 cats" video which is the correct answer so I can go no further. I tweeted him, but chances of him seeing it? If he does, even after Tuesday, and puts it back up then we could still see it, but I don't know the URLs of the rest of the unlisted clips, he'd need to make us a playlist. I haven't gone through all the others yet, so fingers crossed they're still up (Space, Christmas, Deadly Animals and Japanese Candy are fine except for the teacakes in the last one). I'm hoping I've got time to record myself playing each of the stories and clicking through, maybe even two versions eg the wrong options first, then the right ones, and one version of just the right ones, though for the Space one and others with multiple options, it'll go back and forth a lot and loading each clip and quickly full-screening each one is a bit messy, but it's the best I can do. Anyone else with time, disk space and Windows, have a go! OBS is free and pretty simple. Otherwise playlists or maybe a forum thread linking to them in a flowchart design would work. 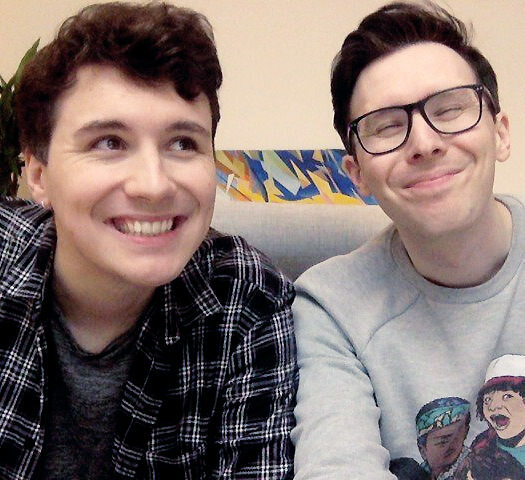 If anyone can check on desktop/laptop browser to see if main channel videos after 2014 for Phil and 2013 for Dan have annotation notes (don't need outlines of links at the ends of normal videos, just the notes), please let me know ASAP. Dragging the timeline slowly across each should show them and I'm doing that, but I might miss one (doesn't work if you just hover over the timeline for the little preview window, though). For the interactives, as long as we make a note of the unlisted clips' URLs, we can still find them separately on his channel - when you click the annotations, each clip has a string of "annotation id" etc in the middle of the URL with the video id at the end, so remove the middle and format the URL to match any other on YT and the link should still work, we just need to make some playlists.